A popular online slot from those purveyors of pukka slots perfection, Ash Gaming, Adventures in Wonderland sees you take the red pill and dive down the rabbit hole to a world of grinning cats, tea parties and crazy queens with playing cards for guards... and there’s not a drop of LSD to be seen anywhere. Yep, Lewis Carroll’s classic tale has been recreated in slots form, and the mobile transition has been pretty seamless on the whole. The same pretty countryside FX have been kept in on the mobile/tablet version, and the simple but nicely-rendered vector graphics are a picture. On the 5 reels and 20 paylines we get famous characters from the stories including Tweedledum and Tweedledee, the Cheshire Cat, the Hookah-smoking worm, plus some regal-looking 10-through-Ace symbols. 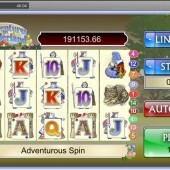 Alice is Wild, substituting for all regular symbols other than the Bonus icons and Scatters, and Five Wilds on the reels pays out 10,000 coins. If that sounds good, though, wait till you see what bonuses are on offer. 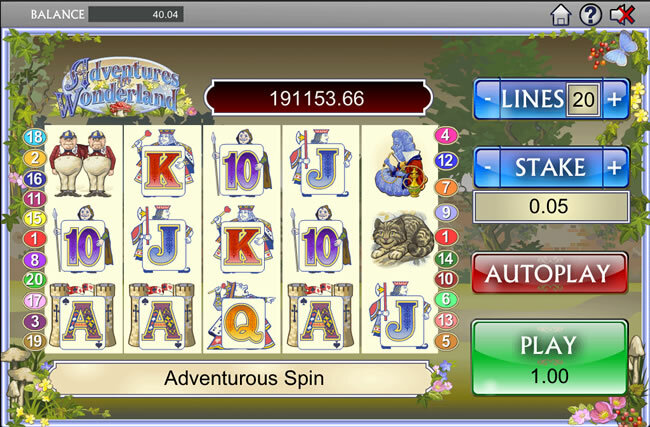 Three or more White Rabbit bonus Scatters across the reels triggers the – bizarrely – White Rabbit Bonus round. He’s normally late, he’s late, but if the moving hands on the rabbit’s watch stops on the right numbers between 1 and 12 you’ll bag yourself tons of free spins. There’s a max of 20 up for grabs. But we’re not finished there – after your free spins total has been determined the rabbit will hop all over the reels leaving a trail of Wilds behind. The Wilds remain locked for the whole Free Spins round. Three or more Mad Hatters across the reels, meanwhile, activates the Tea Party bonus round. Join the Mad Hatter and his friends for a tea party (still no acid to be seen anywhere) where you’ll get to pick cups of tea to drink. The longer the characters drink the more cash you win. So far, so Pick ‘em Bonus mundanity, but wait – keep an eye out for the sugar spoon; if it adds sugar to any of your characters’ teacups you bag yourself a healthy progressive jackpot. Finally, bag the one Rabbit Hole symbol on the middle reel and it will expand to fill the entire reel, triggering the Rabbit Hole Bonus. As Alice tumbles down the hole she collects cash as she goes. When she hits the bottom your cash total is calculated and added to your bankroll. With some really nice, no-nonsense graphics and a great range of bonus features, this is a mobile slot you’ll want to come back to. The interface is nice on the mobiles – it looked a lot less cluttered on my tablet with nice big Spin buttons compared to the online version – and it wasn’t too slow. And, of course, a progressive jackpot is great to see. If you’re after some similarly cute mobile slots fun, check out the Irish-themed madness of Leprechaun’s Luck – also from Ash Gaming – while the innovative bonus rounds of Blueprint’s crime-themed Cop the Lot slot will enjoy the originality on offer.